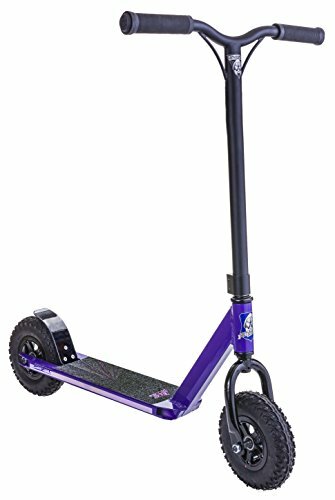 Grit Fluxx Dirt Scooter (Purple/Black) , selling for $250.00 brand new. Manufactured by Grit Scooters. There are 1 units left brand new. The Grit Fluxx Dirt Scooter is designed for younger riders ready for off-road adventure. Stacked with HIC compression, Oversized Reinforced Riser Handlebars, a 4.9″ wide Alloy Deck and 200mm pneumatic tires, the Grit Fluxx Dirt Scooter can handle any surface you can find. Time to get dirty!